Women are powerless against an assortment of their favorite treats, and what better treat than chocolate? We have worked to put together an assortment that will win you epic brownie points, or get you out of the doghouse. 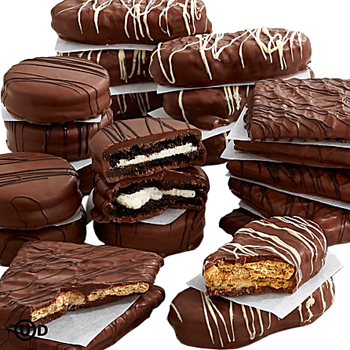 Your recipient will receive her favorite cookies, made even better with a rich chocolate coating. She'll indulge in Chocolate covered Oreo Cookies, Graham Crackers, Nutter Butters, and more all certified Kosher Dairy by Orthodox Union. Celebrate a birthday, say I'm Sorry, or show your devotion with Chocolate Love.